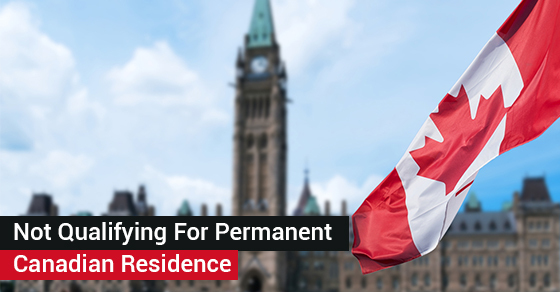 Although you may not qualify for permanent residence in Canada, it’s important to know that you still have options that are available to you. If you don’t qualify for Canadian permanent residence status, you still have the option to fill out a Humanitarian & Compassionate Grounds Immigration Appeal (H&C). This option allows people to apply for permanent residence in Canada even if they don’t otherwise qualify. This appeal is, however, considered to be for exceptional cases. As such, final decisions are made on a case-by-case basis. It is also important to note that there are certain factors that are not considered for the approval of your H&C application but are in fact considered for a refugee claim. In other words, the H&C officer does not consider risks that may exist due to persecution, risk to life and so on. Again, these factors are considered in a refugee claim. Applicants only apply for an H&C application when they are applying for permanent residence status in Canada or if they are applying for a permanent resident visa from overseas. You cannot submit both an H&C appeal and another application like a refugee claim at the same time. If you currently have an outstanding refugee claim, it must be withdrawn. This has to be done before your hearing at the Immigration and Refugee Board (IRB). If you have withdrawn your refugee claim or it was denied, you also have to wait 12 months before applying for an H&C application. However, there are several exceptions to this rule, which you can read about in further detail on our website. If you are considered a designated foreign national, there are also stipulations surrounding when you can apply for an H&C. For example, you will have to wait 5 years before applying since the day you were given this title. There are additional stipulations as well, which you can read on our website here. Our site also has more information about the Humanitarian Grounds Immigration Appeal. Max Berger Professional Law Corporation is a leading Canadian and full-service immigration law firm established in 1987. Contact us for more information.